Enjoy clear, authentic piano sounds as well as other high-quality digital instrument voices. Piano sounds with sympathetic resonance, natural action and the half pedal function all combine to create a realistic tonal palette. Contactless sensing of key movements through premium optical sensors ensures dynamic sensitivity and a balanced touch. The sound module is functional and easy to use. It can be elegantly and discreetly integrated into the design of your Sauter piano. 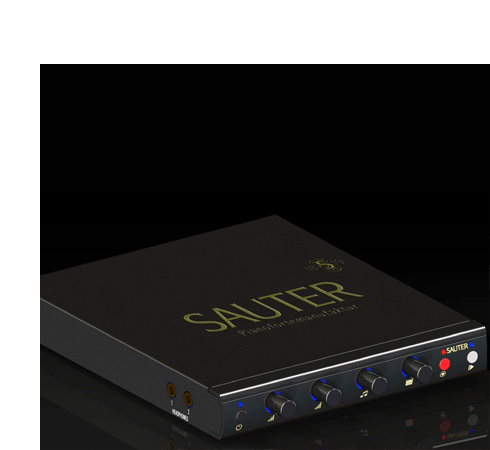 The muting feature – specially designed for Sauter and customized for every instrument – enables you to play your Sauter upright or grand piano with precision and yet silently, without disturbing others. The system’s precise adjustment to your specific instrument and its mechanisms allows you to continue playing in your accustomed style. 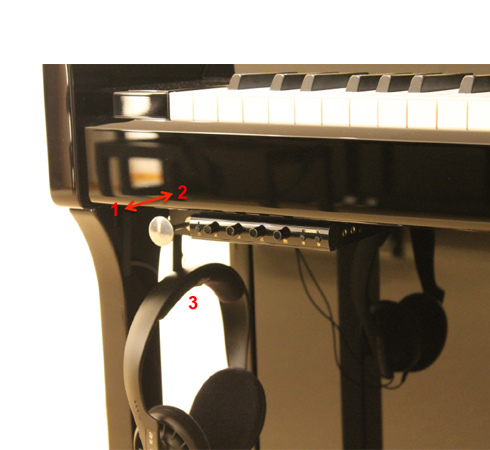 Two sets of headphones can be used simultaneously and controlled individually, enabling independent settings for each listener. Dive into the world of digital sound. Your Sauter SilentPlay can be used with various other devices, such as PCs, tablets, laptops, smartphones, etc. You will be delighted by the superior quality, sound, outstanding touch and appealing design. 1. Activating the muting feature - Mutes the acoustic piano. 2. Deactivating the muting feature - Unmutes the acoustic piano. 3. Headphone hook - For storing headphones. Can be folded out of the way for disassembly of the piano's bottom frame.